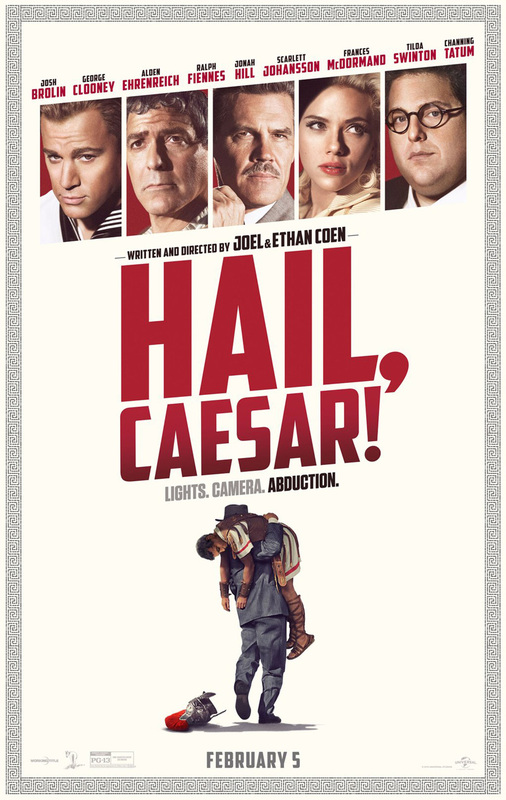 Synopsis: 1950s Hollywood, and a film studio is in the middle of its big budget production of Hail, Caesar! Yet when things begin to go awry, the studio must battle to keep things afloat. Review: The Oscar winning Coen Brothers on writing and directing duties? Check. An all star cast including Oscar winners and nominees? Check. A film set in a time that many would consider to be in the Golden Age of Hollywood? Check. With all these combined, you would think that the visionaries behind The Big Lebowski, the superb 2010 remake of True Grit and No Country for Old Men, would strike gold with this unique and original story, as they have done in the past? The answer, is unfortunately, no. The centre piece of this whole wacky movie is that of Josh Brolin’s Eddie Mannix, the head of Physical Productions and also the man who is there to ensure that the studio’s dirty linen is not aired in public. Yet problems begin to arise here, there and everywhere, most notably the fact that the lead actor on the studio’s massive movie, Baird Whitlock (Clooney) suddenly disappears, after being kidnapped. Yet despite all this, the burden falls onto Mannix to keep everything afloat. The Coens certainly know how to do humour, and do it very well as The Big Lebowski demonstrates, and that humour is on display here and to the maximum with plenty of humorous moments. Furthermore with a top cast of A list Hollywood talent assembled, all excel in their roles. However some are given more opportunities to shine than others, which is a shame as there are some very entertaining characters who you would like to have been given a bit more screen time. Ralph Fiennes in particular has one absolutely golden moment, but this is not followed up. Many of the talents are vastly underutilised and it is just a bit frustrating to watch as you would like to see them have more scenes. In terms of plot, it is a bit of a mess to be honest. Mannix is the main man and its his story that is the centrepiece. Yet there are so many different stories running along at the same time, that it is a little confusing to keep up. What’s more, there are several plot points that are just left hanging. It feels like the Coens just thought of a bunch of random sketches, and concocted them together into one film. As such when the big reveal of what is arguably the film’s primary plot occurs, you just don’t care as much as you could, or maybe should as the script is just too messy and all over the place. What is not out of place though is the detail, 1950s Hollywood has been captured tremendously well and with the one and only Roger Deakins as the cinematographer, you know the film will look absolutely immaculate, and it does. However, despite this incredible attention to detail, this was a real missed opportunity for the Coens to add another top drawer film to their incredible filmography. The film is seen as the Coens love letter to 1950s Hollywood, but it’s a shame that said letter is written in poor handwriting, to the point where it’s almost incomprehensible to read. 1950s Hollywood has been impressively recreated and the Coens pull good performances from their A list cast, particularly from Fiennes and Ehrenreich, it’s just such a shame that it’s all wasted on a weak script.